Discussion in 'Reviews and Tests' started by BC2Tweak, Sep 29, 2016. 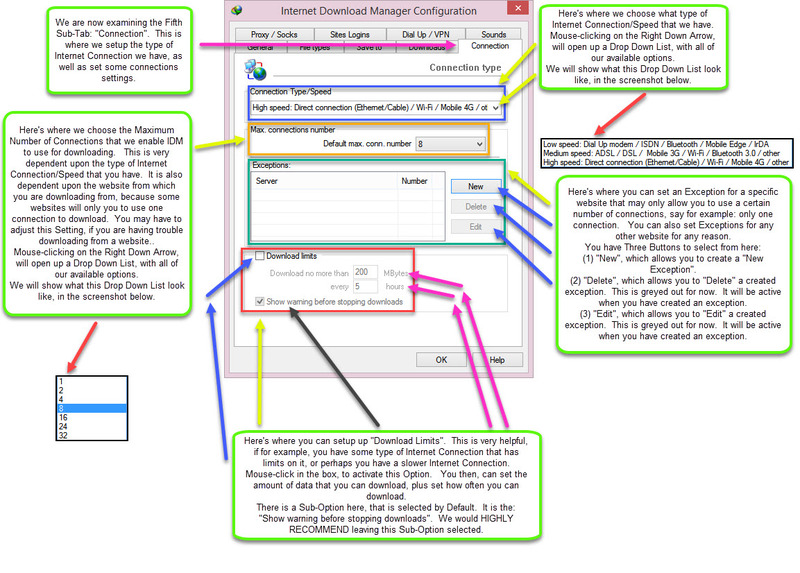 We now present to you a Review on the great program: Internet Download Manager (or, IDM). - For pricing information, please visit the Purchase Page, located above. 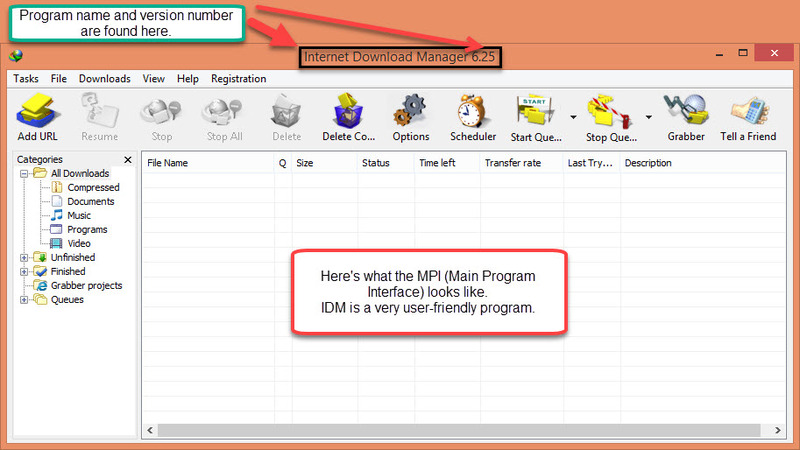 ** After the download and installation of IDM, and upon execution of the program, you will be presented with the following Interface, which we will call the: "Main Program Interface (or, MPI for short)". ** Here's a further description of the functions located on the MPI. ** We will now examine the "Toolbar Area", in more detail. 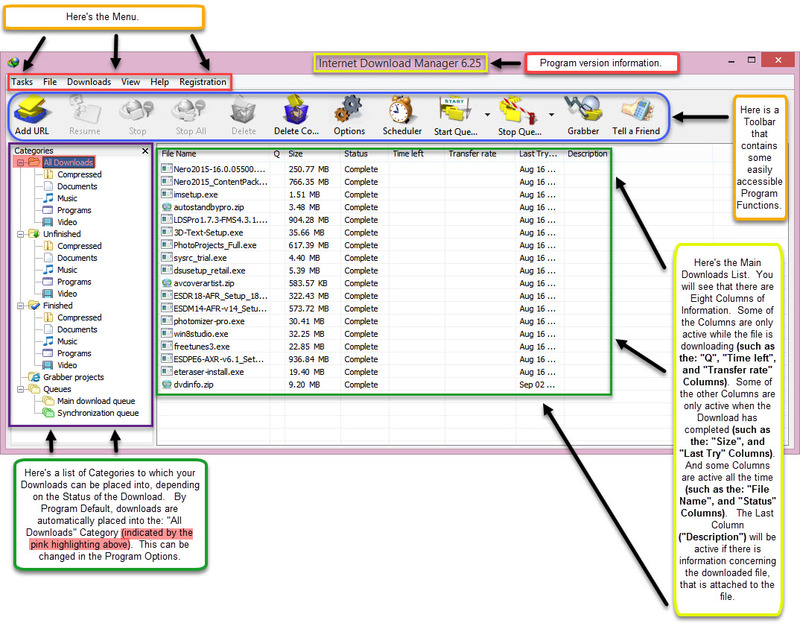 - In the "Toolbar Area", there are Twelve Functions, that can be performed. 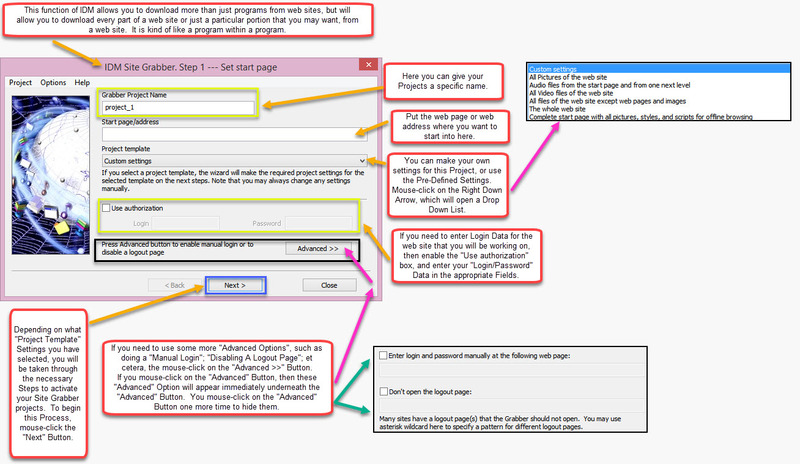 -- #1: "Add URL"--> Mouse-clicking on this Button will open up the following Dialog Pop-Up Box. You can add the address that you want to download from into this Dialog Pop-Up Box, and if necessary, mouse-click the "Use authorization" box, if you need to login to the website (enter your Login and Password in the boxes that become active), then mouse-click the "OK" Button to apply this Option. 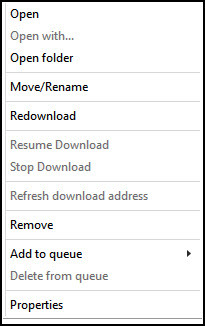 -- #2: "Resume"--> This Button becomes active while a Download is in progress. This Button simply allows you to "Resume" a download that has been paused, providing the download site allows you to do this. 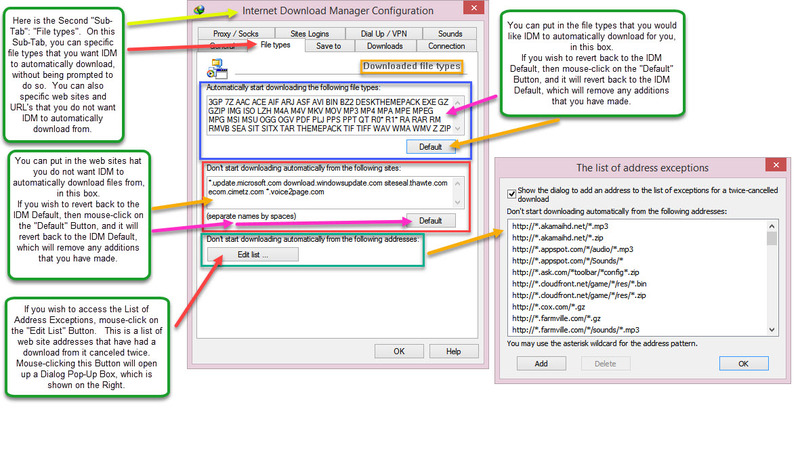 Not all download sites allow you to "Pause" and "Resume". If that is the case, the "Resume Status" will read as "NO", in the Download Progress Dialog Pop-Up Box. -- #3: "Stop"--> This Button becomes active while a Download is in progress. This Button simply allows you to "Stop" the selected download that is in progress. -- #4: "Stop All"--> This Button becomes active while a Download is in progress. This Button simply allows you to "Stop Al Downloads" that are in progress. 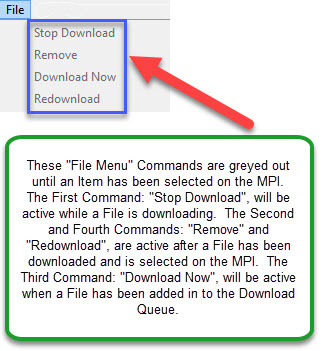 -- #5: "Delete"--> This Button becomes active when you have selected a file in the MPI. This Button simply deletes the file that you have selected from off the MPI. 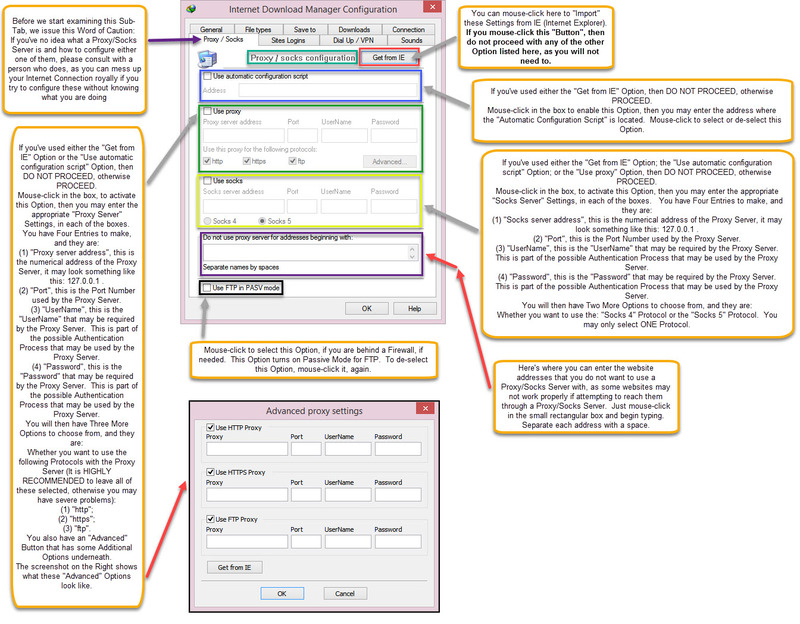 You will receive a Dialog Pop-Up Box, that offers some additional deletion Options. Be careful with this one, because if you select a certain Option, it will remove the file from off your hard drive, as well as out of the MPI. 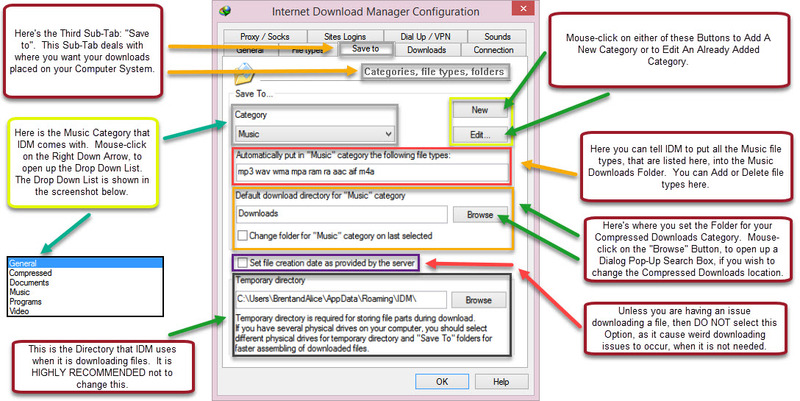 -- #6: "Delete Completed Downloads"--> Mouse-clicking on this Button will open up the following Dialog Pop-Up Box. You can delete all the "Downloads That Have Completed" from off your MPI. This Option does not "Delete" any file from off the Hard Drive. -- #7: "Options"--> Mouse-clicking on this Button will open the: "Internet Download Manager Configuration Dialog Pop-Up Box". This Area has Nine Sub-Tabs on it. 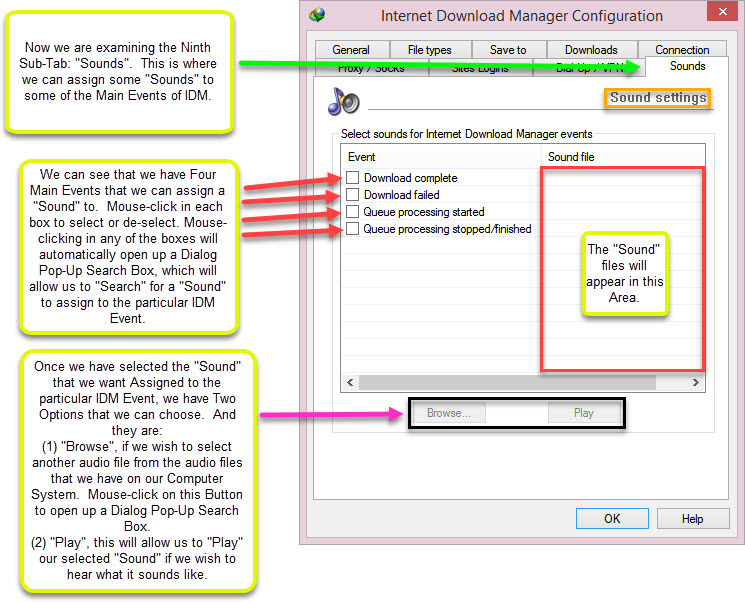 Each Sub-Tab has various Configuration Options, which affect the Overall Operation of IDM. 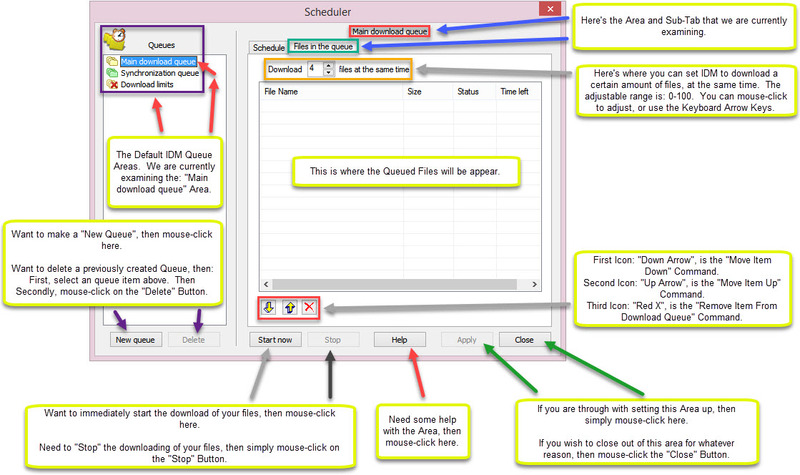 - We start with the: "General Sub-Tab", as shown in the screenshot above. 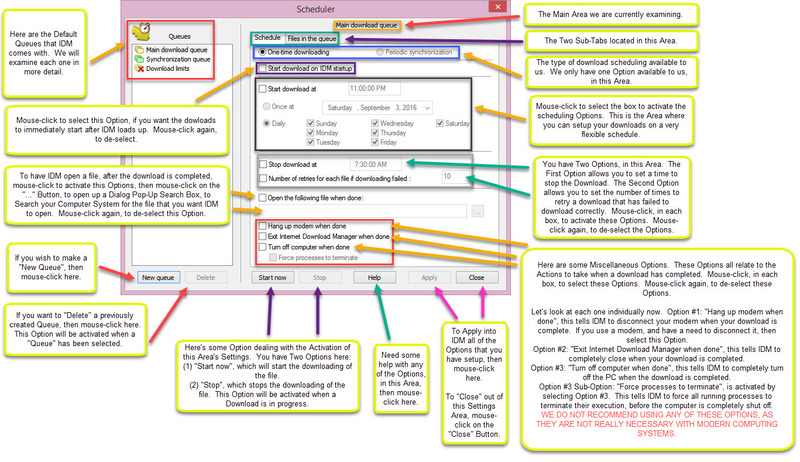 - We then proceed to the: "File types Sub-Tab". - Next, we proceed to the: "Save to Sub-Tab". - Next, we proceed to the: "Downloads Sub-Tab". - Then, on to the: "Connection Sub-Tab". - Now, we will look at the last Four Sub-Tabs. -- Number 6 Sub-Tab: "Proxy/Socks". 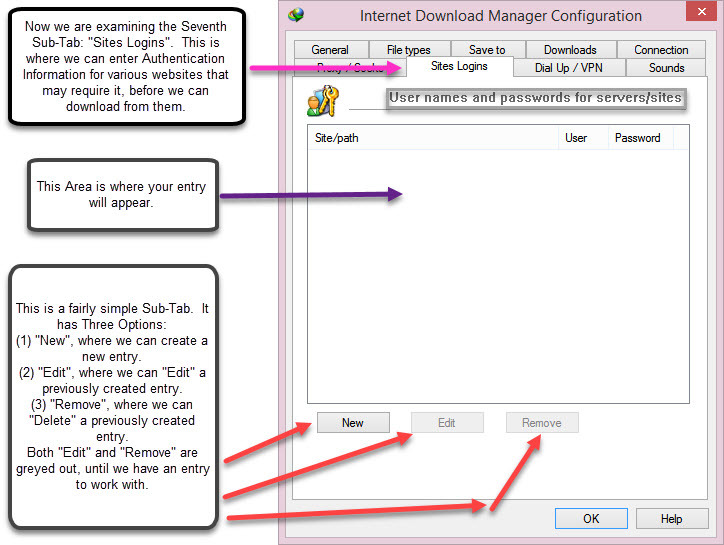 -- Number 7 Sub-Tab: "Sites Logins". -- Number 8 Sub-Tab: "Dial Up/VPN". -- Number 9 Sub-Tab: "Sounds". 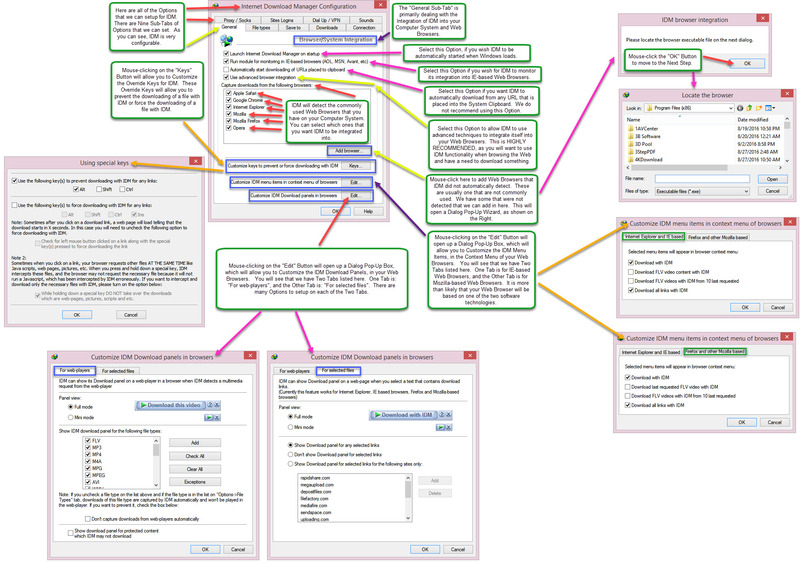 --- Now to continue our examination of the: "Toolbar Area". 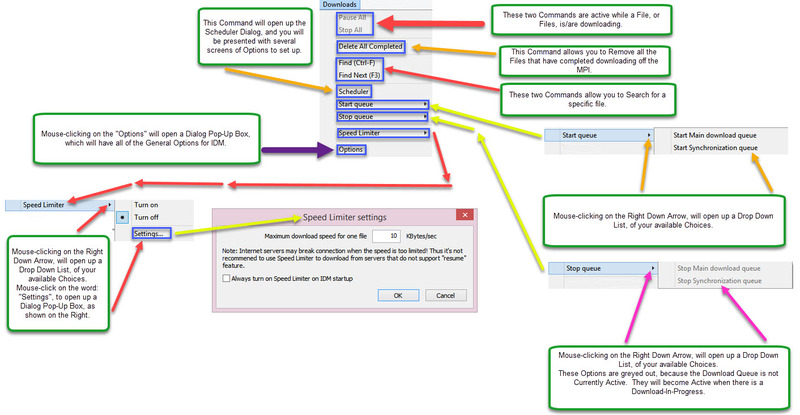 -- #8: "Scheduler"--> Mouse-clicking on this Button will open the: "Scheduler Configuration Dialog Pop-Up Box". 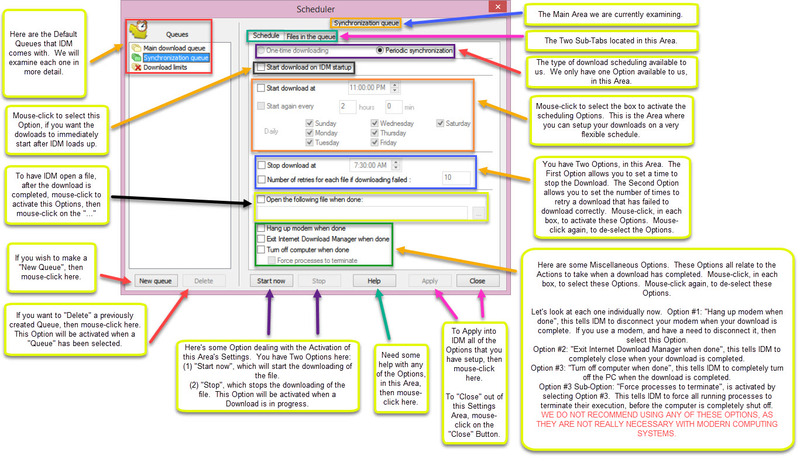 This Area has Two Sub-Tabs on it, plus on the Left Side: "Three Queue Settings Areas". 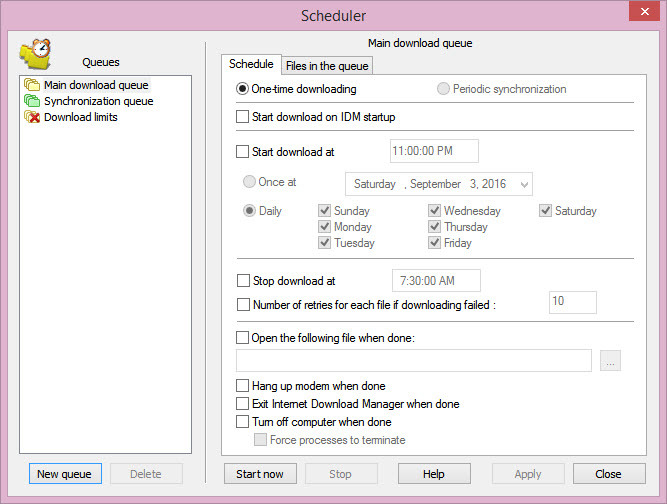 Each Area has various Configuration Options, which affect the Scheduling Functions of IDM. 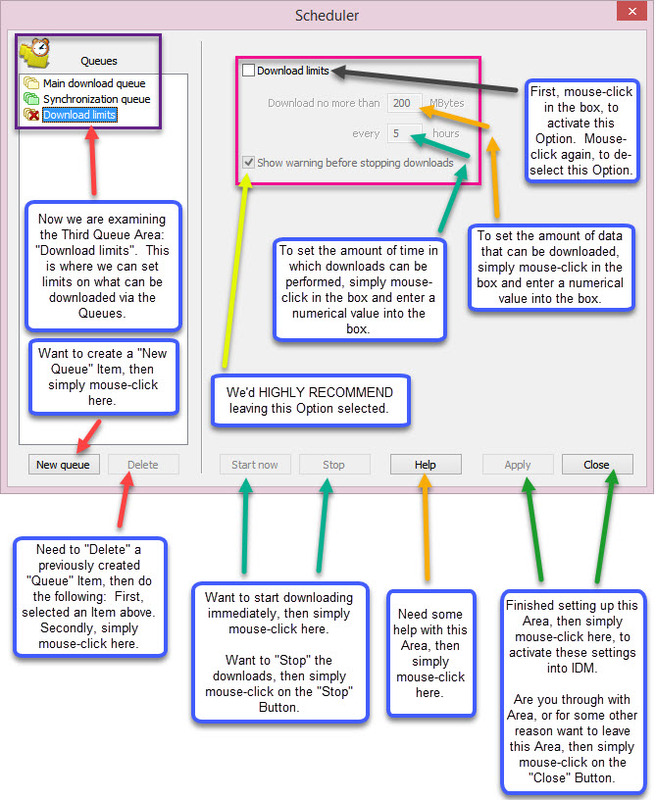 -- #9: "Start Queue"--> Mouse-clicking this Button will immediately start the Download Queue. If you wish to see what other Options are available to you, the mouse-click on the Right Down Arrow, to open up a Drop Down List with all your available options. 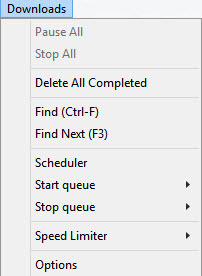 -- #10: "Stop Queue"--> Mouse-clicking this Button will immediately stop the Download Queue. If you wish to see what other Options are available to you, the mouse-click on the Right Down Arrow, to open up a Drop Down List with all your available options. 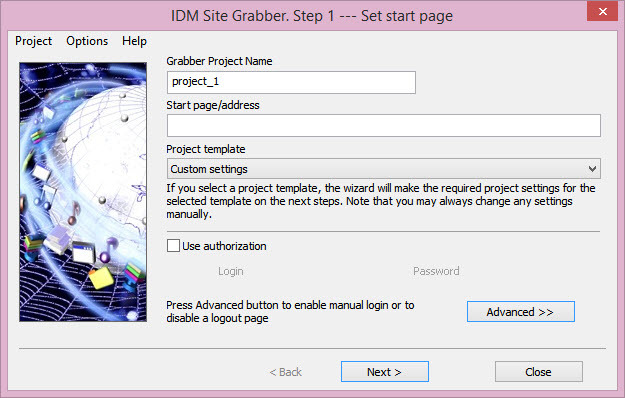 -- #11: "Grabber"--> Mouse-clicking on this Button will open the "Site Grabber Wizard". You will be through a step-by-step. Because of the time consumption of this process, we are not going to show the whole process, but will simply show you the beginning of the process. 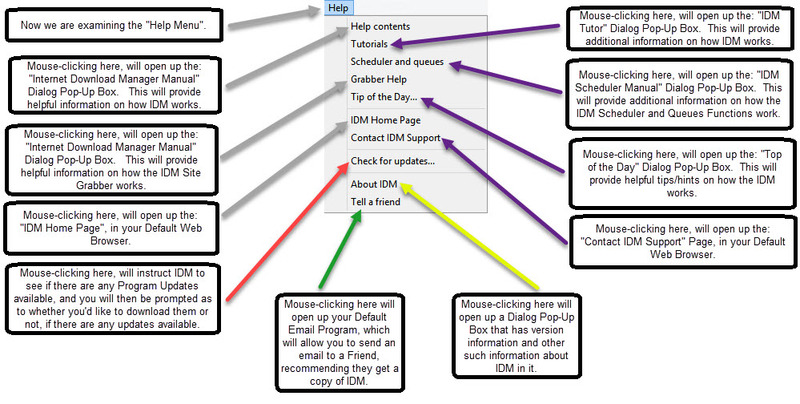 -- #12: "Tell a Friend"--> Mouse-clicking on this Button will open your Default Email Program, to where you can write to a Friend and recommend that they get their copy of IDM. 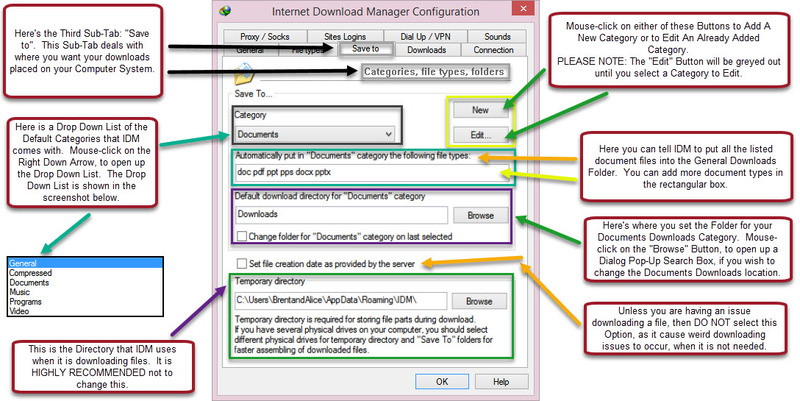 ** Now, let's examine the IDM Menu, in detail. - First, we will examine the "Tasks Menu". 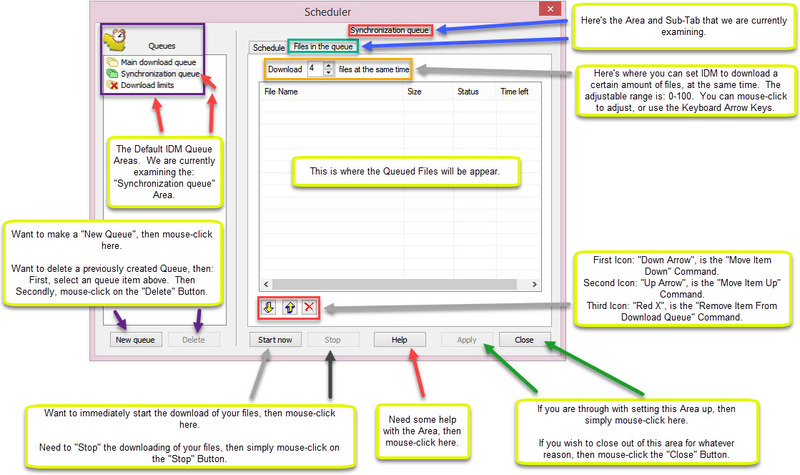 -- Here's again the "Site Grabber Wizard", which can also e executed from this Menu. 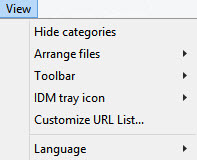 - Secondly, we will examine the "File Menu". 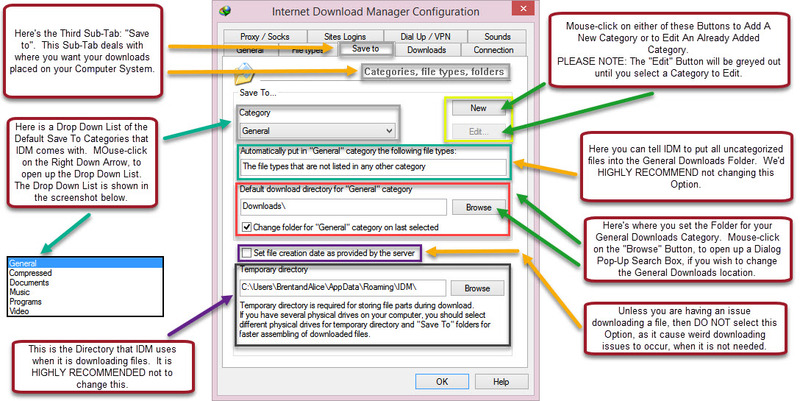 - Thirdly, we will examine the "Downloads Menu". - Fourthly, we will examine the "View Menu". - Fifthly, we will examine the "Help Menu". - Sixthly and Lastly, we will examine the "Registration Menu". 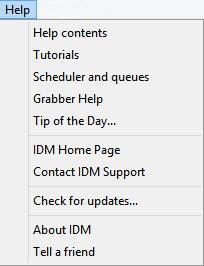 ** The Last Item that we will look at, is the "IDM Right-Click Menu". This is a Menu that is accessible on the MPI. If you simply right mouse-click on a file listed there, then it will bring up some Options that are available on the other Menus of IDM. AlexK, hnbp16, jasonX and 9 others like this. OM lord will your Software reviews ever stop amazing me .... ?? jasonX, RGiskardR, Der.Reisende and 4 others like this. With the vast amounts of information presented in each screenshot, there must be some color variations to prevent the information from running together, as well as to keep the reader interested. Plus, it makes it fun!! jasonX, RGiskardR, Der.Reisende and 3 others like this. 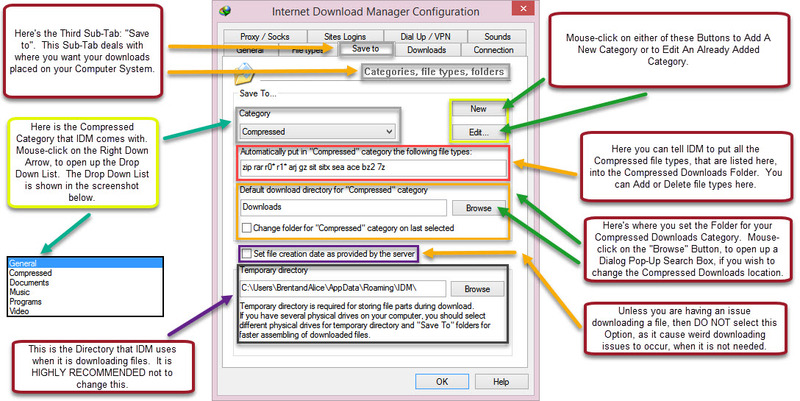 I have tested many download managers but IDM is the top, it manages to squeeze all the possible speed! Great review of a great software. Great and well explained review @BC2Tweak . 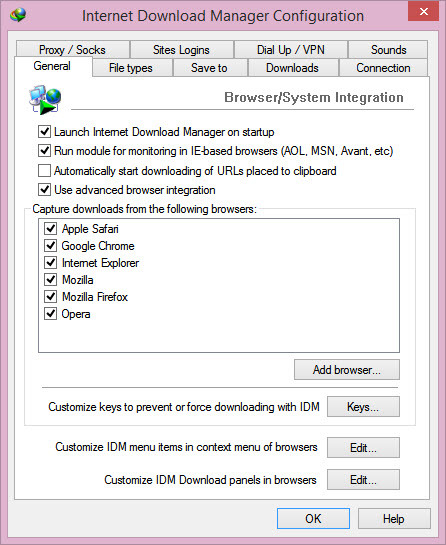 I also really like IDM, it is fast, light, intuitive and very simple to use. jasonX, RGiskardR, revC0de and 3 others like this. Der.Reisende, Trim, RGiskardR and 2 others like this. Amazing review buddy. Love your work! Der.Reisende, Trim, revC0de and 3 others like this. Der.Reisende, revC0de, BC2Tweak and 2 others like this.